"I am so thrilled to be a part of Lauren's Playground! I feel it is far above and beyond of what was expected. Especially with the content, layout, and workout routines. The material is in the greatest HD quality and the motivation is all there. I'm speechless because I feel part of a worldwide team. It's unique to give you the right tools and lessons to progress and grow. Every time I'm there I don't feel alone but with with support from Lauren and the gang. Her voice, her example, and real life women working it all out is very encouraging! I knew about Lauren online years ago but I had not tried her DVDS. I was a Pilates instructor for a temporary time and loved bootcamp training at the park. I wanted fitness to be my career. What I wanted like many of us was to look and feel awesome and great! The weight wasn't coming off quickly and I had spent a lot of money in Pilates Certifications and Nutrition Online program where I had a coach. In all these real cases the weight would always come back. Unfortunately I would get stuck in a vicious cycle. All this time I tried Lauren's free challenges and read her blog. Since this special includes my time with a coaching call I will only be accepting a limited number this time around. Here is what this offer will include. Never see a charge again and get lifetime access. If you’re interested in the upgrade you can message sales@ontheedgefitness.com to Let them know you snagged a lifetime spot - that way you won’t be charged again. To assure you get a spot you can pay for your lifetime membership now and be sure to email the sales team so you receive your access code (if you're brand new) or to get taken off the monthly pay. I’m looking forward to speaking with you on a call and helping you take your training and lifestyle to the next level! We are so excited to now be offering a LIFETIME membership. As we continue to add more content each and every month, you will keep the same rate for a lifetime. You will never pay another cent on your membership. 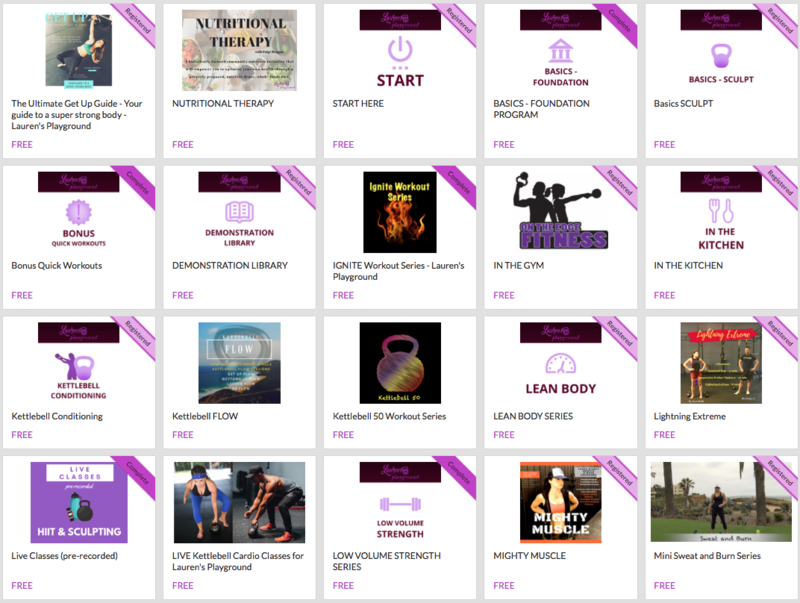 With hundreds of hours of workouts, videos and programs for all levels, you'll never be bored. - 15% off any nutrition or fitness product all year round. Once you purchase your LIFETIME membership we will send you a lifetime access code. NOT INTERESTED IN LIFE TIME OPTION? BECOME A MEMBER TODAY HERE BEFORE THE MONTHLY OR YEARLY OPTION GOES UP. TRAIN WITH LAUREN BROOKS ANYWHERE IN THE WORLD! some of the courses you'll find inside. After many years of working hard to come up with a solution that can bring new and fresh workouts to you anywhere in the world with access 24 hours a day... I'm proud and excited to announce the solution is finally here! Custom live classes can now be easily accessed to you any time or any place in the world. I'm ecstatic to finally be able to deliver you something in the raw that can work for anyone! I call it "Lauren's Playground" because I feel like I'm playing when I'm training. I want you to feel like you're playing too! We are excited to grow with you and have a blast along the way! This will hopefully bring you a fresh new feel and a new found love for your training. It's going to be an ever evolving platform of community, education, support, workouts, discussions and yes we will be open to your requests. If you don't want the life time membership sign up here and you'll be grandfathered in at the current rate. Even as we grow your price will stay the same while you're an active member. EXPERIENCE ONGOING TRAINING AND PROGRAMS WITH LAUREN BROOKS THAT WILL LITERALLY CHANGE YOUR LIFE! Lauren's playground has truly changed my life. I am a stay at home mom of a 2 year old and I have been struggling to get back to my pre-baby fitness level since my son was born. When I joined the playground I finally felt like I had found a clear path to get back to the fitness level I wanted. There is so much flexibility, so many options, and the workouts are so efficient that I rarely feel like I have a good reason to skip a workout, I can always find a way to fit something in. In addition, Lauren's instruction is so spot on and positive that I am always in a better mood when I am finished. Lauren’s playground is terrific! 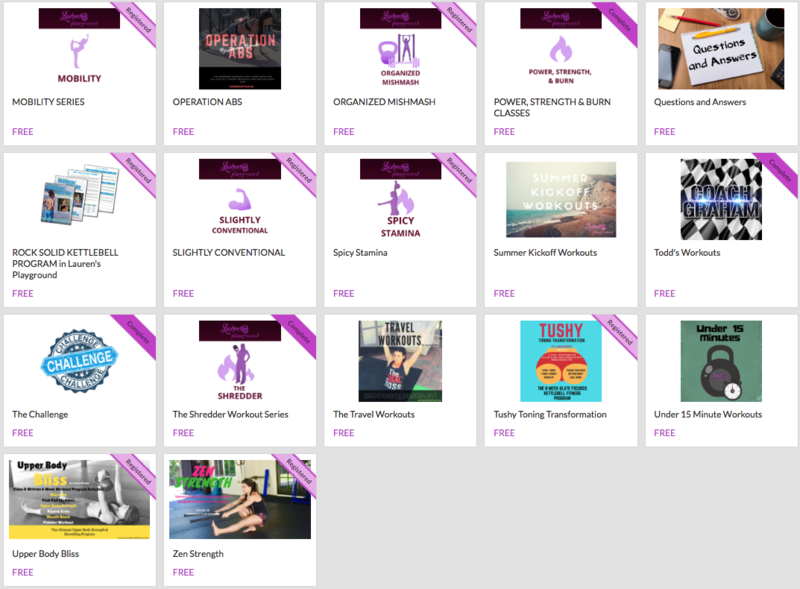 No matter what your fitness level is, familiarity/level with kettlebells, age, male or female, or your fitness goals, Lauren’s playground has something for everyone! Not to mention the monthly price for what you get is a steal! I love everything about the Playground! It is by far the most comprehensive on-line offering I have seen! With Lauren's expertise and her strong desire for ALL her students to achieve that which they seek, she and her husband Todd truly are working overtime making sure the Playground,is not only effective and results-driven but also fun and user friendly for everyone! Only own one kettlebell? Whether you got one kettlebell or a collection of them, you can do the classes at the Playground! Brand new to kettlebells? The playground offers the basics when it comes to proper and safe kettlebell training. Advanced? Want to lose fat? Get strong? Improve conditioning? The Playground has got all that covered too! The newly added “In the Kitchen” shares recipes that Lauren prepares for her family! The playground provides written versions of the classes that you can download and print out. You also have the option to stream them on your devices! This means you can do these classes anywhere that is convenient for you!. Also – you can do them anytime of the day or night and any days you want! The Facebook group associated with the Playground has folks from all over the US, and overseas, ranging in age from 20s to 70s. The group is great because it really does provide accountability (for those that need it), cheering you on, and also providing support and a real sense of camaraderie. So do yourself a favor and join! You will only regret not signing up! I am so thrilled to be a part of Lauren's Playground! I feel it is far above and beyond of what was expected. Especially with the content, layout, and workout routines. The material is in the greatest HD quality and the motivation is all there. I'm speechless because I feel part of a worldwide team. It's unique to give you the right tools and lessons to progress and grow. Every time I'm there I don't feel alone but with with support from Lauren and the gang. Her voice, her example, and real life women working it all out is very encouraging! I knew about Lauren online years ago but I had not tried her DVDS. I was a Pilates instructor for a temporary time and loved bootcamp training at the park. I wanted fitness to be my career. What I wanted like many of us was to look and feel awesome and great! The weight wasn't coming off quickly and I had spent a lot of money in Pilates Certifications and Nutrition Online program where I had a coach. In all these real cases the weight would always come back. Unfortunately I would get stuck in a vicious cycle. All this time I tried Lauren's free challenges and read her blog. I have almost all Laurens dvds and I love them. But I would only work out off and on for the past 3 years. So when the playground came out I told my husband let me just try it out for one month, I cant pass up signing up because I have to see everything Lauren puts out. The other day I told him, just so you know I'm never cancelling this membership! It truly has made me a different person. I am determined, I work out regularly, I am way stronger in just the time that Incinerator and playground came out. I am in love with everything on the playground. It exceeded my expectations by a mile. A couple things that impresses me is 1) that the written workout is right on the side of the video (please don't ever change that) it helps me see whats ahead and allows me to get my bells setup. 2) the coaching Lauren does throughout the video, the little things like take a sip of water, remember to tighten the glutes, relax shoulder and neck, breathe, engage the lat, if your not shaking your plank is not active and so on and so on - these are all things we know but as we are working out we cant remember everything so the reminders help me keep the proper form. What I think of the playground so far. This is really great. if you are used to Lauren you'll fit right in - if you are new to Lauren, you can pick it up right away. Lauren has you covered form Basics, to Tabatas, a lot of little extra perks, and more is coming. I love the little extra stuff (the written work, the Kitchen which will hopefully include some vegan options as it grows!) the fact that if all you have is 1 or 2 bells, Lauren has modifications even though all extra equipment (stools, and trx) is used). if you are a Big Girl (Or Broad Guy) and wondering if you can do this/keep up. yes. The online facebook group is great. Once again, Lauren has hit this one out of the park ...and right into the Playground! :) This has been live for two months now, and it is astonishing how much content already is available. This really is full spectrum from beginner to advanced. You choose the programs that work for you. You can't go wrong.